Description: Densely or somewhat loosely caespitose perennials, rarely rhizomatous. Culms moderately slender, slightly compressed, smooth, many-noded, mostly <1.2 m tall, often loosely intertwined or scrambling amongst shrubs. Sheaths keeled and compressed upwards, becoming loose, glabrous, smooth or minutely scabrid; ligule membranous, 0.5–2 mm long, truncate; blade flat, 10–30 cm long, linear, tip acuminate, not rigid, glabrous, scabrid to almost smooth. Inflorescence much exserted, to 19 cm long, somewhat contracted or spreading. 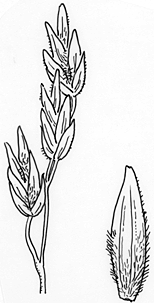 Spikelets lanceolate, 2–7-flowered. Glumes acute, 1–3-nerved. 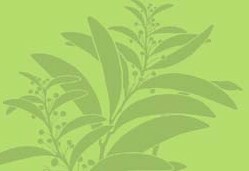 Lemmas 5-nerved, obtuse or subacute, web moderately copious to absent; palea minutely scabrous on the keels above. Distribution and occurrence: Grows in woodland on sandstone near the coast.